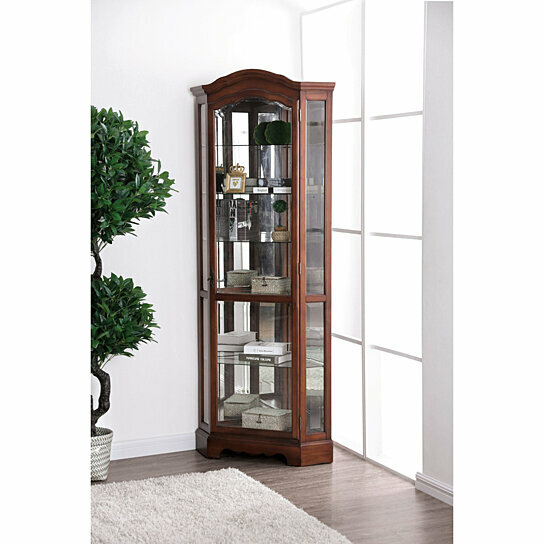 Enhance the beauty of your living room interior with this glass door corner cabinet. It is made up of oak brown finished wood and with glass shelves and side panels. This cabinet will not only create a traditional and unique look but will also help in arranging various things at home. This also features multiple shelves with scalloped trimmed bottom design. Also the crown shaped cabinet head gives a vintage appeal.